The Eurogroup of companies specialise in the management of pest and bird control, washroom and clinical waste services to customers both large and small. We pride ourselves on our commitment to service, delivery and our affordable combined service packages. Value for money and providing peace of mind to all of our clients is paramount to the ethos of all of the Eurogroup personnel. 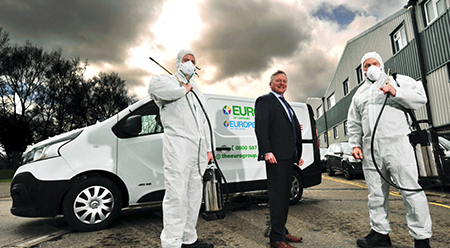 Eurogroup began as Europest Environmental services in 2001, as a specialist, quality driven local pest control provider. Our aim has always been to locate the niche in the service market between the sole trader and national companies which enables us to fulfill demanding service schedules whilst providing a quality driven service, and most importantly value for money. In 2005 we were approached by a number of clients to provide sanitary and nappy disposal waste services, due to the inadequacy and disappointment of the service delivery of their then service provider. This exposed a niche in the washroom service market between the large national and small sole trader service providers which the Eurogroup of companies has been allowed to expand its service delivery. Embracing their original principles of a professional, quality driven, committed service team and ability to provide value for money and peace of mind, the Eurogroup has grown into a specialist pest control and washroom and waste service provider, with a small enough to care attitude, whilst being large enough to deal with any site specification or requirement. We pride ourselves at providing more service coverage at local level compared to both national and local companies for our target service areas, which therefore ensure we are able to provide a professional reactive response to all of our customers’ needs and requirements. Expert proactive advice is an imperative part of both our services allowing our customer to make informed decisions whilst maintaining their reputation or saving money. Our trained technicians and surveyors take professional pride in giving good quality advice and recommendations. service when the needs arise. We would relish the opportunity to visit your business to offer advice and endeavor to save your business money whilst maintaining a quality driven, professional service thereby giving you peace of mind.